The pizza business is booming. It seems that there is a new pizza store opening in every neighborhood of every state, all across America. In fact the growth is so vast that pizza has become a stand alone 34-billion dollar industry all of its own. Of course in order for you to cash in on your piece of the pie (no pun intended), you need to start by choosing the right brand to run with. Rosati's Pizza is the perfect brand. 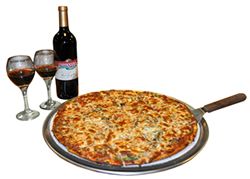 Rosati's Pizza has provided delicious pizza, pasta, sandwiches and more for over 40 years. Our family recipes originated in Italy and have become a tradition of quality for five generations. 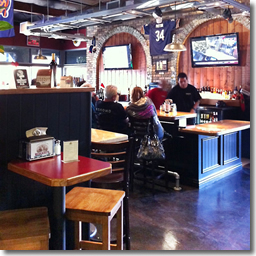 Being a Rosati's owner is not like being part of a franchise, it's like being part of the family. Sure, we give you the same benefits and support as a large chain, but we provide it in a unique and personal manner. You're not just a number to us; we are committed to your success. Prior to opening, our team will assist you in all facets of training-kitchen, counter, pizza-making, drivers and management. When the time comes for your exciting grand opening, there is not doubt you'll be prepared. We will also help in working out many of the pre-opening bugs that may develop. 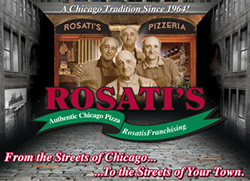 Click on Request Information for FREE info on how to open a Rosatis Pizza Franchising franchise today! Please Note: This Rosati's Pizza Franchising franchise opportunity and other franchise business opportunities, businesses and franchises for sale on this web site are not to be considered as an "offering", "franchise offering", suggestion or recommendation by Franchise Leader™. This advertisement depends entirely on the truthfulness of the information provided by our advertisers which includes, but is not limited to, franchisers, franchise brokers, franchise consultants and business brokers. Franchise Leader™ recommends that you consult a lawyer, financial consultant, accountant or professional advisor before buying a franchise or business opportunity or any type of business. By using this form or any part of our website, you have agreed to all terms and conditions of Franchise Leader™. Please review our Terms & Conditions for more information.